On August 30th, general manager of Taiwan CDC, Jih-how Chou, and his team visited Derekduck. Taiwan CDC is interested in our medical non-woven products and marketing development strategy for Southern Asia. General manager of Derekduck, Jason Lin, shared several cases of preventing epidemic wearing ULTITEC coverall, our own brand. ULTITEC was founded in 2008, it focuses on Asian market and has gained great success in Southeast Asia. 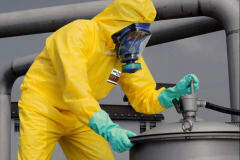 The performance of ULTITEC 2000, ULTITEC 3000T and ULTITEC 4000 all exceeds both WHO protective clothing specification option 1 & 2 for Ebola infection control. In 2004, Derekduck donated 10,000 pieces of ULTITEC 2000 to Taiwan CDC in order to prevent Avain influenza. ULTITEC 2000 is recognized by Taiwan CDC as official medical purchasing item. ULTITEC 3000 is also recognized by COA in Taiwan, Thailand and Myanmar for preventing Avain influenza and other epidemics. General manager of Taiwan CDC hopes to create business opportunities when implementing Southern policy. Derekduck will also try our best to help Taiwan government in epidemic prevention.